A return to Chorus? 2019 This thread currently has 1,459 views. Imagine those crisp, icy synths in a remastered edition!! How about a finished, final version of "Tune 5" (Mirror to Your Soul)?? haven't noticed tends to be how some of the bonuses in other releases are chosen). Still, it was a prolific period to fill a second CD with! Being slightly less cynical about it, I'd like to see some versions which haven't appeared in those compilation already. Likewise the 'Dave Bascome' Mix of 'Am I Right' has only ever been released on CD in the EBX set, so I'd personally choose that. Those KROQ versions could also see the light of day officially on CD, and maybe there are some other session versions knocking around. CD2. ALL of the Chorus demos and unreleased Chorus-era tracks like My Love and Earth (for sake of completion), KROQ sessions, possible unreleased demos/sessions/mixes?? CD3. a disc of ALL NEW remixes including 1 each by Vince and Andy. Seriously, it won't be hard to find remixers for this album! Do it right Mute!! And as dreamy as all this sounds, we can't forget Two Ring Circus and Wild! Even if TRC gets skipped, Wild! also needs some remastering attention before we move on to Chorus. I really wish Erasure would do like PSB and re-release every album as a clean and uniform remastered series. Erasure certainly deserve it. Lesser bands have been given better treatment! DVD. Tank, Swan & Balloon DVD, only because the previous re-releases included a concert DVD. I don't think this is going to happen, and I suspect they're rethinking the format for any upcoming album remasters. Firstly, unlike the concerts in the previous re-releases, 'Tank..' has already been released on DVD, so it isn't so special. format for the album remasters - meaning both the 'Chorus' and 'Wild' deluxe sets will follow the same format as each other and feature no DVD concerts. Of course they might just repackage both concert DVDs in both re-releases (and make Moscow To Mars even more pointless). 'Chorus' might be a way of selling it again. But I'd gamble on there been no concert DVDs with future album remasters - although what that means for the Tiny Tour I'm not sure! Good points. My hope is that the Wild! Tour DVD was included in FMTM because they are secretly planning to include a DVD of the Wild! Party, which hopefully Mute has in their video archives. That way, they could add another disc to the FMTM box set to make it more appealing, and the fans will later have a good reason to buy the Wild! remaster. Win win for the fans! Right?? It's true that Tank, Swan & Balloon likely didn't sell very well, but it did come out at a weird time (on DVD in the US). Most casual fans weren't looking for it and probably never knew it was released. Since most casual fans would buy a Chorus Deluxe Edition, they would probably be happy to have TSB on DVD. My hope is that the Wild! Tour DVD was included in FMTM because they are secretly planning to include a DVD of the Wild! Party, which hopefully Mute has in their video archives. Would be nice, but I really think this is highly unlikely as well - I doubt Mute have EVER had the video for this concert in their archives. video deck and recorded the live camera feeds for the venue concert screen, with no audio. It was done with neither the permission of Mute, Erasure or the venue. anything about it. The person recording it was of course doing so illegally. So no, I doubt we are going to see an official release of this video on DVD. to get into the cactus suit again! To bring the topic back to Chorus, it's quite clear there is no shortage of goodies they could include in a Deluxe Edition. Sure, some of it may have been released here and there, but certain songs like My Love (such a great, great song!) should have a bigger audience than just Buried Treasure II. It still boggles my mind that one went unreleased at the time! 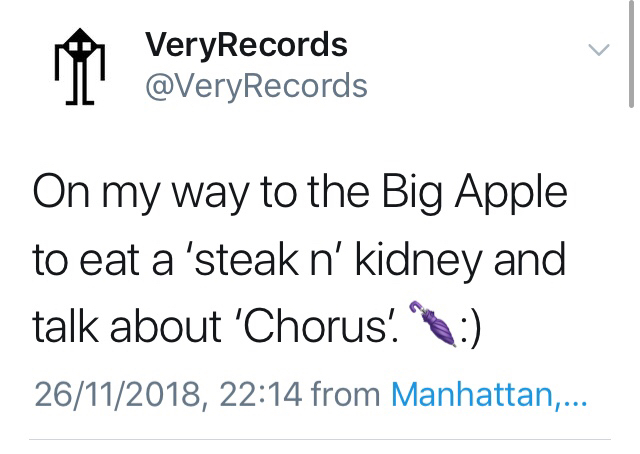 I guess they just had too much great material to work with and hopefully there are some other items in the vaults that we haven't heard (officially or bootleg). It would be nice to see an extensive Chorus package curated with love. But surely in those days it wasn't so easy to sync the audio perfectly onto a video tape? And if it was an employee of the bowl, why would they go to so much trouble? Well, we know from a tweet earlier this year from Vince that he’s done a new mix of Turns the Love to Anger - I assumed that would be for this. Also a certain remix & production team said in Summer 2017 they were working on new mixes for Wild! and Chorus reissues (That facebook post came down very quickly!) I also wondered about the ‘Monteverde 7” Mix’ of 2000 Miles on From Moscow is to Mars; assuming it’s the same Lee Monteverde who did mixes for I Could Fall in Love With You’ in 2007, I reckoned this must be a recent commission rather than been sitting in the vaults since 1989/90 - if so, again, was it an early commission for an expanded Wild! ? Because they were also a fan? Fans do that sort of thing! And syncing might be hard, but not impossible. Although sometimes it's easy. I know - I've done it! Also, I'm not sure the video itself was done at the time, but synced to the radio concert much later. who put the video together told that story - that they surreptitiously recorded the live video feed without permission. on this forum may recall the facts of that story better. then release it to the world as a bootleg. Based on that knowledge (and assuming the story is true! ), it is my own deduction that it means the video is in THEIR possession and not Mute's.